Posted October 29th, 2011 by Ryan & filed under Computers & Internet. 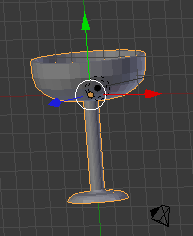 Looking to create a simple wine glass in Blender 2.5/2.6? Yes, there’s quite a few steps. But it’s remarkably easy to do. First step is to create the default cube. 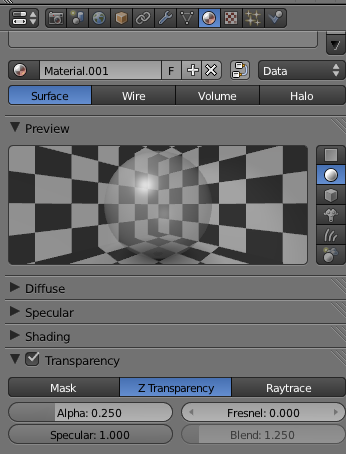 Right click to select it and press either Delete or X to remove the cube from the scene. Next we’re going to go in to the top view by pressing num-7. 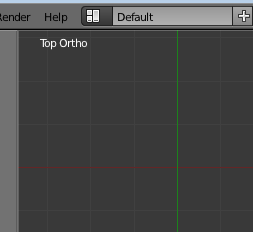 I also went ahead and switched to ortho view by pressing num-5, although that’s not necessary. Now we need to get some vertices to work with. Easiest way I’ve found is to create a 4 edged circle – yes, I know that’s a square. But adding a plane would also add a face which isn’t necessary. So shift-A in the top view and select Mesh -> Circle. Change the vertex count to 4. Radius doesn’t matter since we’re going to be moving the verts around anyway. Switch to Edit mode by either pressing tab or changing the dropdown in the 3D header. Press A to deselect all the vertices and then right click to pick one to delete. It doesn’t really matter which one. Once it’s selected press Delete or X and select Vertices from the menu that pops up. 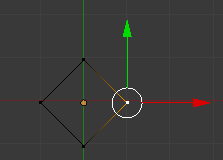 You’ll be left with a mesh with 3 vertices like the following. And it’s time to start moving verts around. Right click on the top vertex to select it. 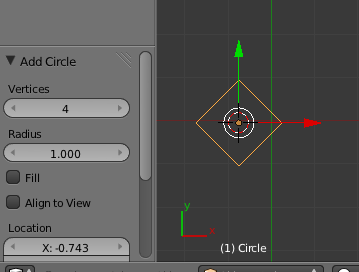 Press G to grab and move the vertex to where you want the top edge of your glass to be. Do the same with the other two verts so that you have the start of a wine glass profile. One thing to not is that we’re using the green Y axis as the center of our wine glass. This will be important in a bit when we spin our profile. But 3 vertices isn’t enough. To add a vertex you’re going to Extrude from the last one. 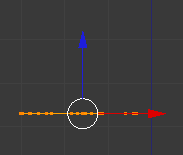 With the bottom vertex selected, press E and Blender will add a vertex to your mesh. Move the new vertex in to position. 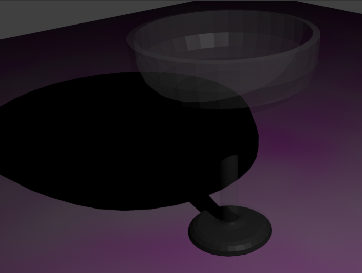 Continue adding vertices until you have almost reached the Y axis with the bowl of the glass. Your bowl shouldn’t quite reach the Y axis so that there’s room for the glass stem. And then continue down the stem onto the base. The inner most vertex on the base should be as close to the Y axis as possible because the mesh should close at the bottom. It doesn’t have to be exact though. 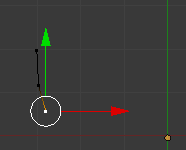 We’ll merge vertices after the spin to close it all the way. And the last step before spinning is to go and give the bowl some depth by extruding from the top most vertex, along the curve, and finishing as close to the Y axis as we can. Like the bottom most vertex, the close the better, but we’re going to do a merge in a bit for that point as well. You’ll wind up with something like the following. Now it’s time for the spin. Change from top view to front view by pressing num-1. Your design should now be a straight line because we’re looking at it from the front. Press A to select all the verts. You may have to press A twice if you still had a vertex selected, once to deselect and once to select all. Before we spin we want to go back to object mode for just a second and get everything centered. Once there press the N key and then set the location to 0 for all 3 axes. This will make it easier to spin in the next step. Switch back to Edit mode and click on the spin button. You’ll set degrees to 360 to make the glass go all the way around and the X,Y, and Z all set to 0 to match the location from above. You’ll also probably want to bump the steps count up to make the glass smoother. I picked 32, although you can select whatever you think looks right. And now it’s time to check your work. Middle mouse button drag the view around so that you can see your glass. It’s still not quite done though. We need to close in the midlines. Zoom in all the way in on the bottom of the glass. You’ll likely notice that the vertices don’t quite meet. Fortunately Blender makes it easy to merge. 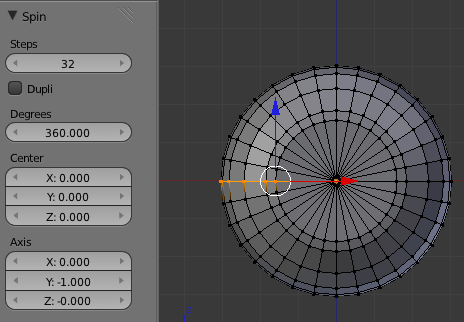 While in Edit mode hold down the control key and drag a circle around the vertices. Once they’re all selected, press alt-M and pick At Center to merge all of the vertices at the center. The glass is now closed at the bottom. Repeat the same process on the vertices at the center of the bowl. You may find that you got your center vertices close enough to the Y axis that they’re already merged. 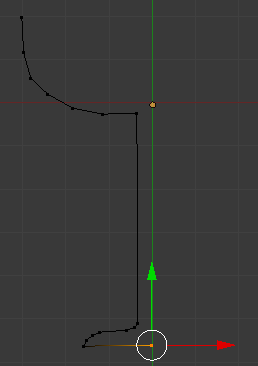 Blender will try to guess when you get verts really close to each other. 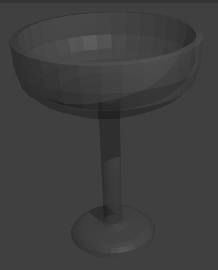 But it still doesn’t look like a glass when rendered, so we’ll make it transparent. Switch to Object mode and click on the Materials tab. 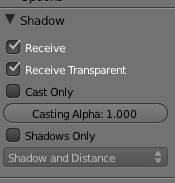 Make a new material, check the Transparency check box, and set the Alpha. The closer the Alpha to 0 the more transparent. I usually start at about 0.1 and go up or down from there. If you render right now it’ll be a little tough to tell that they glass is transparent though. So we’re going to throw down a quick plane under the glass with a cloud texture just so we can tell that it’s transparent. One catch, and it’s something that took me a lot of Googling to find a solution for, is that they shadow isn’t transparent. It’s solid black. 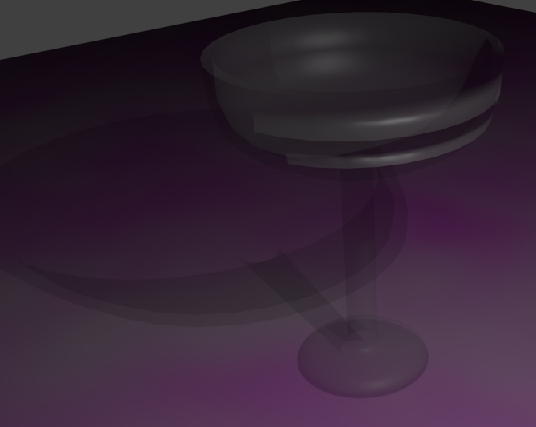 The trick is that the surface receiving the shadow needs to be set to receive shadows from transparent objects. So click back on the plane and then the materials tab. Scroll down to the Shadow section and make sure that Receive Transparent is checked. Note that this does add to the time required to render, so you might want to leave it off until you’re ready for a final render. Last thing we’re going to do is select the glass in Object mode and select Smooth Shading. That will tell Blender to not render the individual faces, but smooth them out like a real glass. Like the shadows, this will slow down rendering. But it looks much more realistic. And you should wind up with something like the following.